JRPGs tend by nature to be repetitive. You slog through the same random encounters over and over, and the same strategy works every time; occasionally a preemptive strike will shake things up, or leveling up will unlock a new ability that changes the boilerplate formula you apply for the next hour or two. 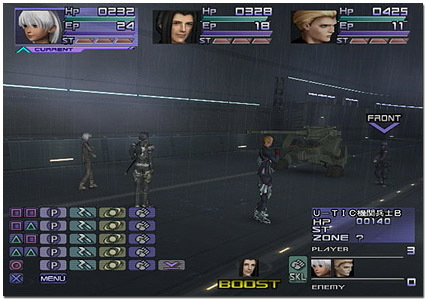 Giving the player optional goals to pursue during combat can make that slog a lot more engaging, especially if those goals come into conflict with the primary goal of “win the battle efficiently.” The simplest example is the ability to steal items, common in Final Fantasy and elsewhere – you can get by without doing it, by and large, but it usually pays to trade some time and damage output for a chance at extra resources. Here are three games that provide great reasons to think about the long-term effects of your choices in battle instead of sleepwalking through. A screenshot would not do justice to the symphony of chaos that is a Grandia battle. Grandia’s exceptional combat system frankly doesn’t need any tricks to keep the player interested – if anything needs help in Grandia it’s the bottom-of-the-anime-barrel writing and voice work – but the dungeon crawler spinoff Xtreme is more of a grind than the mainline entries. So it offers an optional challenge in every battle: if you can win without taking any damage, which probably means before the enemy gets a turn, you get a bonus multiplier on the XP earned in that battle. 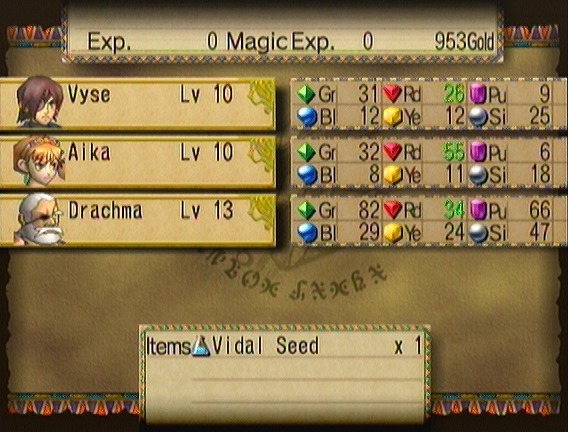 For fights against enemies that are much lower level than your party, this is pretty easy to achieve – which is nice, because as you’d expect, the XP you get from fighting scrubs is unimpressive. For fights where the monsters aren’t such a pushover, deciding whether to go for the XP bonus requires some risk/reward calculation: it’ll probably take some expensive special moves to wipe the enemy out that quickly. If you fall short, you’ll have blown resources for no gain, but if you pull it off, the XP boost is substantial. Skies of Arcadia characters use Fruit Gushers to cast magic. Don’t ask how Silver tastes. Enemies in Skies of Arcadia are each aligned with one of six colors (elemental affinities, in function if not flavor), and will take more damage when you use attacks of a superior color, determined by a rock-paper-scissors graph: red beats green beats purple, and so on. On each character’s turn you can rotate between any of the colors you’ve unlocked so far. At the end of each battle, your party earns both normal XP and magic XP. Each color of magic gains XP independently, and the color of weapon each character has equipped when the battle ends determines how the XP is invested. The colors are far from interchangeable; all the healing spells are green, and silver has both the revival spells and the instant death attacks. So long-term, you want to end battles with the color of weapon that will unlock the spells you need most, even if in the short-term it hurts your damage output to use anything but the color the enemy is weakest to. The rate of random encounters in SoA is super high, and the combat itself does little to provide variety between battles (though it has one great mechanic in the shared SP bar, which I will talk about more in a later post and which I totally ripped off in Demon Thesis). Switching your characters’ weapon colors each turn to pursue either short-term combat efficiency or long-term character development adds an interesting wrinkle that the game needs badly. The SKL icon in the lower right means this is a good turn to kill a dude. Xenosaga takes (and merits) a lot of abuse, but there are some really great ideas in each installment’s combat system. My favorite is the Event Slot from Episodes I & II – a sort of turn clock which rotates through a set of effects that drastically alter the decision making process. One slot increases damage from attacks on that turn, one slot increases the efficiency of charging the “boost meter” that allows for interrupting the normal turn queue, and one slot grants bonus XP* for killing enemies while it’s active. Because I am mildly obsessive-compulsive, I went to extreme lengths to ensure that as many enemies as possible died while that bonus was in effect. This might only mean holding back a deathblow until the right moment, but sometimes I had to spend a boost to get out of a cycle where the bonus always came on the enemy’s turn. If I accidentally killed an enemy a turn too quickly because I misjudged how much damage I could deal in a turn, I felt like I messed up. Did I mention the bonus randomly varied between a factor of two, five, and ten? Even a less (ahem) dedicated player than myself would have to stop and think real hard about how to time their actions just right to take advantage of a tenfold increase in reward. *It’s not actually “XP”, it’s Tech Points, Ether Points, and Skill Points, but c’mon. I am Chris Doucette, a vidjagame programmer with a Ph.D. in Molecular Biology. I make a point of telling people that I have a Ph.D. in Molecular Biology, because that is the only utility I will ever get out of having a Ph.D. in Molecular Biology. As of summer 2016 I'm an independent developer finally putting my money where my mouth is and making the crunchiest turn-based RPG I can imagine. It's called Silicon Void and you can follow its development here and at the links above. The Silicon Void Kickstarter is Live!